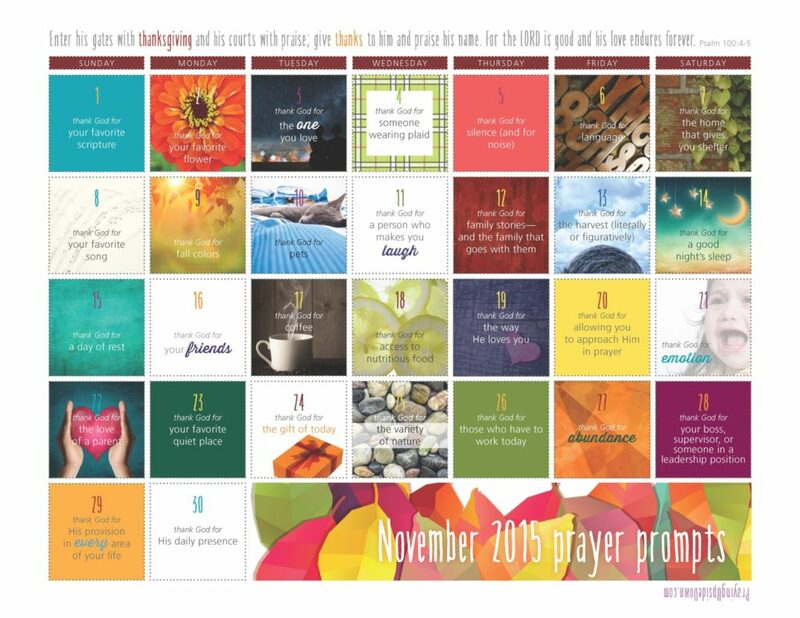 I love to design my monthly prayer prompt calendars. I love the colors, the quirky connections, and coming up with the themes. There are more ideas than time to produce them. The hard part is narrowing it down and selecting a direction. That’s where you come in. Because you know what? I think there are lots of you out there with great ideas, too. And there are a lot of online ministries I’d be honored to help in this small way, so I decided to run a contest for bloggers. 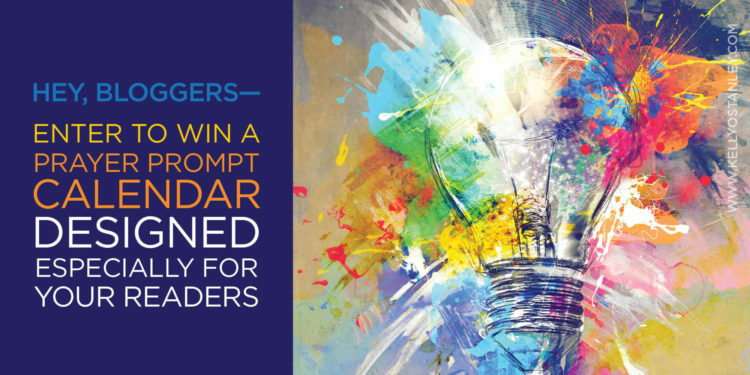 Submit your idea for a theme for my March calendar before January 31, and if I select your idea, you win! You’ll get a calendar designed around that theme that you can give away on your blog (either free when they subscribe to your blog, or just as a free download for everyone—your choice how to promote it). I will also use it as the March calendar on my website, but I will publish it on my blog, linking to your blog, along with a brief introduction to you and your message. You don’t have to be a designer to participate—in fact, I hope you’re not, because then I have more leeway! 🙂 Your idea does not have to be completely thought through, nor does it have to look like one of mine. The sample calendars throughout this post are provided to help you start thinking. Many of mine so far have centered on that month’s holidays, like Christmas or Valentine’s Day or summer, but even in those cases, I’ve gone in a certain thematic direction (love, thankfulness, etc.). Let yourself be creative! At the same time, know that I’ll choose one entry based on the possibilities I see to be creative with it, so you don’t really need to provide the creativity—and you never know what idea will intrigue me the most. Here are some examples of what I’m looking for. Your submission does not have to be any more detailed than the samples below. Psalm 91 (“Whoever dwells in the shelter of the Most High will rest in the shadow of the Almighty. I will say of the Lord, “He is my refuge and my fortress, my God, in whom I trust.”)—calendar would include prayers about shelter (giving thanks for it), prompts related to things like protection, security, steadfastness, leaning on God, etc. To enter, leave your ideas in a comment below or email me (kellyostanley@me.com). I need your website/blog URL and a brief description of your idea (doesn’t have to be any more detailed than the examples above) and how that relates to your site/ministry/message/book. You may include a sample prayer prompt or two, or not. If you have a certain style in mind, you can mention that (or show me a sample image)—or leave that part up to me. If I select your entry, I will be in touch to learn more about your ministry and theme and to ask if you’d like to submit some of the specific prayer prompts as well. (Totally up to you; I am glad to come up with them myself, if you’d like.) Remember: deadline is January 31, and I’ll design the calendar by Feb. 20 so you have some time to promote it before March 1. Good luck! Can’t wait to hear your ideas! P.P.S. If you happen to be a man, I promise not to make the calendar look feminine or frilly. Don’t rule out this opportunity based on how my calendars have looked in the past. It just so happens that the majority of my readers are women, so I let myself be girly sometimes. What an amazing opportunity! Thanks for offering your talents to others. I will be sending you an email. Lovely idea! And you do such beautiful work. Thank you for a chance to win. Sent you an email!!!! You know I adore your beautiful calendars and talents! This is amazing!!!! I hope you get tons of beautiful ideas! What a great idea and a fantastic opportunity. Your work is beautiful and edifies the Lord in every way possible, and draws our hearts and minds back to the importance of prayer. love, Love, LOVE IT! What a beautiful idea to promote prayer and in a format that motivates others to have a stronger relationship. . I will be sending an email. Kelly, this is a fabulous opportunity! I will send you an email on your contact page. Thanks for this offer. Your calendars are beautiful and inspiring! This is such a neat opportunity! I like to encourage mommas of all backgrounds and would love to see a design built around affirmations (biblical truths) that they could pray and claim for themselves! WOW!!! This is fantastic!! I’m developing a website about being Christian http://beingchristian.info and what a grand thing this would be to have for launching the site! So my theme idea is just that… Being Christian. 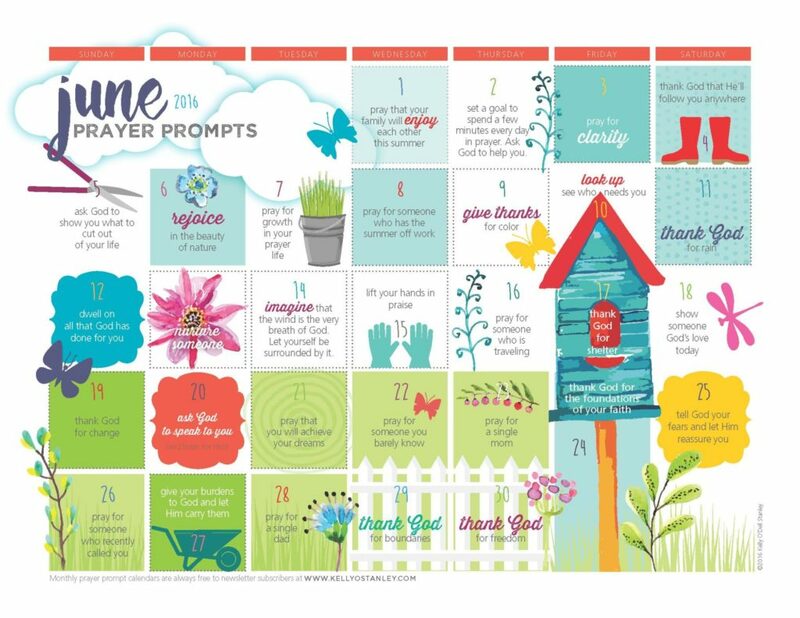 How about a calendar that promotes as well as prompts random acts of kindness? Thank you so much for the chance to win. I really like your chalk board theme. If I win, just surprise me. I absolutely love this! I blog at http://www.betheproof.org. The entire idea is about being the proof of Jesus Christ and the legacy that you leave behind as you live your life in the here and now. 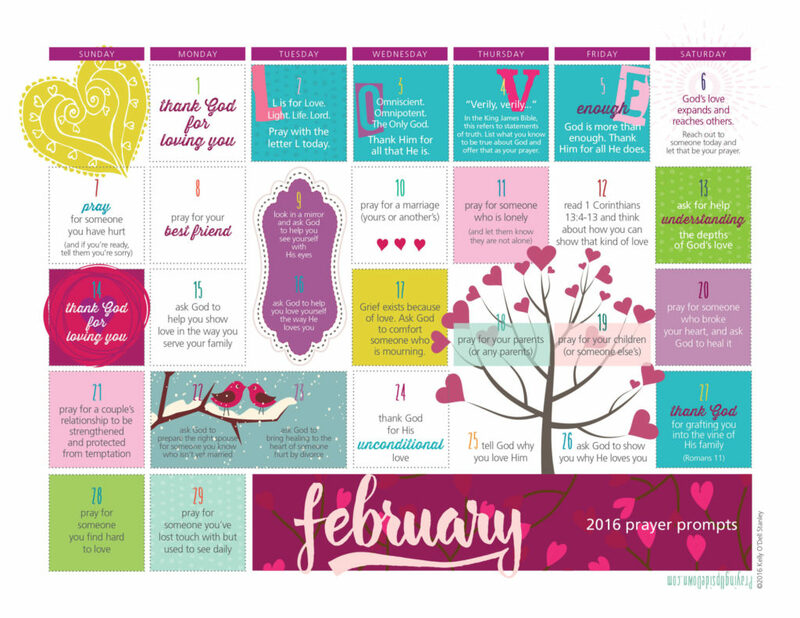 I think a calendar that gives prompts to praying for different aspects of your legacy – how you love, serve, pray, etc. – would be absolutely awesome! Kelly — because of your contest my blog has come to fruition! Thank you. Our blog (my husband and I)is called Walking in Hard Places and is meant to be an encouragement to those who are dealing with cancer. The subtitle is: God’s Lessons in Terminal Cancer, https://walkinginhardplaces.wordpress.com/. We have been battling cancer for twenty years on and off and know that God is calling us to share what He has been teaching us. Thanks for kindling a fire under me. That’s awesome that you were able to use this to bring your blog into fruition! Sounds like you’ve been through some hard places and would have a lot to share! Well, I’m not a blogger, but I have begun a bible study/prayer group his year for our ladies group with the theme of THE ARMOR OF GOD. Just a suggestion, it would be cool to see an ARMOR OF GOD prayer calendar.. I am an adult adoptee and I blog at http://www.PeachNeitherHereNorThere.blogspot.com. 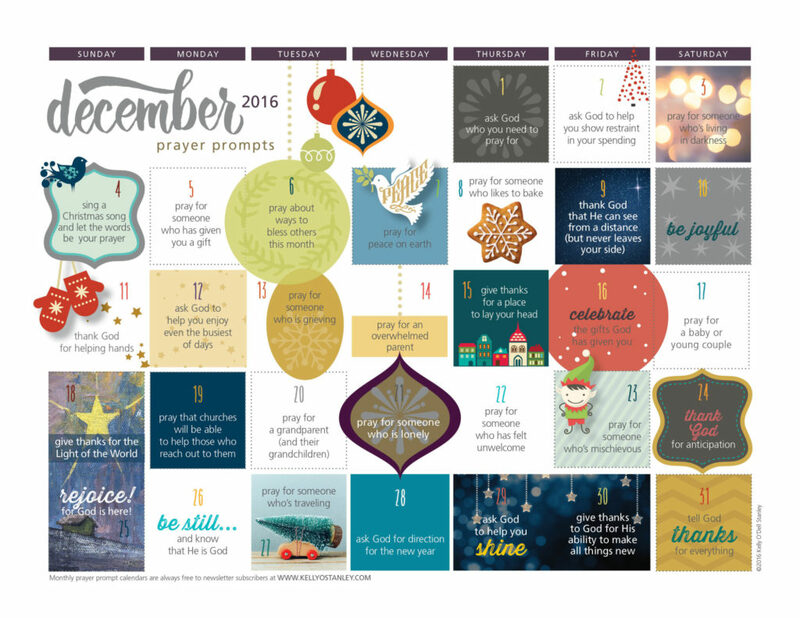 A prayer prompt calender based on the theme of Trusting God as Our Loving Father would be such a blessing.